Two-dimensional (2D) materials with potential applications in photonic and optoelectronic devices have attracted increasing attention due to their unique structures and captivating properties. However, generation of stable high-energy ultrashort pulses requires further boosting of these materials’ optical properties, such as higher damage threshold and larger modulation depth. Here we investigate a new type of heterostructure material with uniformity by employing the magnetron sputtering technique. Heterostructure materials are synthesized with van der Waals heterostructures consisting of MoS2 and Sb2Te3. The bandgap, carrier mobility, and carrier concentration of the MoS2-Sb2Te3-MoS2 heterostructure materials are calculated theoretically. By using these materials as saturable absorbers (SAs), applications in fiber lasers with Q-switching and mode-locking states are demonstrated experimentally. The modulation depth and damage threshold of SAs are measured to be 64.17% and 14.13 J/cm2, respectively. Both theoretical and experimental results indicate that MoS2-Sb2Te3-MoS2 heterostructure materials have large modulation depth, and can resist high power during the generation of ultrashort pulses. The MoS2-Sb2Te3-MoS2 heterostructure materials have the advantages of low cost, high reliability, and suitability for mass production, and provide a promising solution for the development of 2D-material-based devices with desirable electronic and optoelectronic properties. A. K. Geim and K. S. Novoselov, “The rise of grapheme,” Nat. Mater. 6, 183–191 (2007). F. N. Xia, T. Mueller, Y. M. Lin, A. Valdes-Garcia, and P. Avouris, “Ultrafast graphene photodetector,” Nat. Nanotechnol. 4, 839–843 (2009). Q. L. Bao, H. Zhang, B. Wang, Z. H. Ni, C. Lim, Y. Wang, D. Y. Tang, and K. P. Loh, “Broadband graphene polarizer,” Nat. Photonics 5, 411–415 (2011). A. Martinez and Z. Sun, “Nanotube and graphene saturable absorbers for fibre lasers,” Nat. 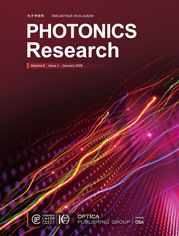 Photonics 7, 842–845 (2013). F. N. Xia, H. Wang, and Y. C. Jia, “Rediscovering black phosphorus as an anisotropic layered material for optoelectronics and electronics,” Nat. Commun. 5, 4458 (2014). F. N. Xia, H. Wang, D. Xiao, M. Dubey, and A. Ramasubramaniam, “Two dimensional material nanophotonics,” Nat. Photonics 8, 899–907 (2014). Z. P. Sun, A. Martinez, and F. Wang, “Optical modulators with 2D layered materials,” Nat. Photonics 10, 227–238 (2016). T. Hasan, Z. P. Sun, F. Q. Wang, F. Bonaccorso, P. H. Tan, A. G. Rozhin, and A. C. Ferrari, “Nanotube-polymer composites for ultrafast photonics,” Adv. Mater. 21, 3874–3899 (2009). Q. L. Bao, H. Zhang, Y. Wang, Z. H. Ni, Y. L. Yan, Z. X. Shen, K. P. Loh, and D. Y. Tang, “Atomic-layer graphene as a saturable absorber for ultrafast pulsed lasers,” Adv. Funct. Mater. 19, 3077–3083 (2009). Z. P. Sun, T. Hasan, F. Torrisi, D. Popa, G. Privitera, F. Q. Wang, F. Bonaccorso, D. M. Basko, and A. C. Ferrari, “Graphene mode-locked ultrafast laser,” ACS Nano 4, 803–810 (2010). G. Sobon, J. Sotor, and K. M. Abramski, “Passive harmonic mode-locking in Er-doped fiber laser based on graphene saturable absorber with repetition rates scalable to 2.22 GHz,” Appl. Phys. Lett. 100, 161109 (2012). F. Bonaccorso and Z. Sun, “Solution processing of graphene, topological insulators and other 2D crystals for ultrafast photonics,” Opt. Mater. Express 4, 63–78 (2014). J. Lee, J. Koo, Y. M. Jhon, and J. H. Lee, “A femtosecond pulse erbium fiber laser incorporating a saturable absorber based on bulk-structured Bi2Te3 topological insulator,” Opt. Express 22, 6165–6173 (2014). F. H. Koppens, T. Mueller, P. Avouris, A. C. Ferrari, M. S. Vitiello, and M. Polini, “Photodetectors based on graphene, other two-dimensional materials and hybrid systems,” Nat. Nanotechnol. 9, 780–793 (2014). S. X. Wang, H. H. Yu, H. J. Zhang, A. Z. Wang, M. W. Zhao, Y. X. Chen, L. M. Mei, and J. Y. Wang, “Broadband few-layer MoS2 saturable absorbers,” Adv. Mater. 26, 3538–3544 (2014). H. H. Yu, H. Zhang, Y. C. Wang, C. J. Zhao, B. L. Wang, S. C. Wen, H. J. Zhang, and J. Y. Wang, “Topological insulator as an optical modulator for pulsed solid-state lasers,” Laser Photon. Rev. 7, L77–L83 (2013). D. A. Smirnova, I. V. Shadrivov, A. I. Smirnov, and Y. S. Kivshar, “Dissipative plasmon-solitons in multilayer grapheme,” Laser Photon. Rev. 8, 291–296 (2014). H. B. Jiang, Y. L. Zhang, Y. Liu, X. Y. Fu, Y. F. Li, Y. Q. Liu, C. H. Li, and H. B. Sun, “Bioinspired few-layer graphene prepared by chemical vapor deposition on femtosecond laser-structured Cu foil,” Laser Photon. Rev. 10, 441–450 (2016). F. Wang, A. G. Rozhin, V. Scardaci, Z. Sun, F. Hennrich, I. H. White, W. I. Milne, and A. C. Ferrari, “Wideband-tuneable, nanotube mode-locked, fibre laser,” Nat. Nanotechnol. 3, 738–742 (2008). Z. Q. Luo, D. D. Wu, B. Xu, H. Y. Xu, Z. P. Cai, J. Peng, J. Weng, S. Xu, C. H. Zhu, F. Q. Wang, Z. P. Sun, and H. Zhang, “Two-dimensional material-based saturable absorbers: towards compact visible-wavelength all-fiber pulsed lasers,” Nanoscale 8, 1066–1072 (2016). R. I. Woodward and E. J. R. Kelleher, “2D saturable absorbers for fibre lasers,” Appl. Sci. 5, 1440–1456 (2015). Z. C. Luo, M. Liu, H. Liu, X. W. Zheng, A. P. Luo, C. J. Zhao, H. Zhang, S. C. Wen, and W. C. Xu, “2 GHz passively harmonic mode-locked fiber laser by a microfiber-based topological insulator saturable absorber,” Opt. Lett. 38, 5212–5215 (2013). S. L. Yu, X. Q. Wu, K. R. Chen, B. G. Chen, X. Guo, D. X. Dai, L. M. Tong, W. T. Liu, and Y. R. Shen, “All-optical graphene modulator based on optical Kerr phase shift,” Optica 3, 541–544 (2016). J. Mohanraj, V. Velmurugan, and S. Sivabalan, “Transition metal dichalcogenides based saturable absorbers for pulsed laser technology,” Opt. Mater. 60, 601–617 (2016). J. Sotor, G. Sobon, W. Macherzynski, P. Paletko, and K. M. Abramski, “Black phosphorus saturable absorber for ultrashort pulse generation,” Appl. Phys. Lett. 107, 051108 (2015). H. Jeong, S. Y. Choi, F. Rotermund, K. Lee, and D. Yeom, “All-polarization maintaining passively mode-locked fiber laser using evanescent field interaction with single-walled carbon nanotube saturable absorber,” J. Lightwave Technol. 34, 3510–3514 (2016). W. S. Kwon, H. Lee, J. H. Kim, J. Choi, K. Kim, and S. Kim, “Ultrashort stretched-pulse L-band laser using carbon-nanotube saturable absorber,” Opt. Express 23, 7779–7785 (2015). X. M. Liu, H. R. Yang, Y. D. Cui, G. W. Chen, Y. Yang, X. Q. Wu, X. K. Yao, D. D. Han, X. X. Han, C. Zeng, J. Guo, W. L. Li, G. Cheng, and L. M. Tong, “Graphene-clad microfibre saturable absorber for ultrafast fibre lasers,” Sci. Rep. 6, 26024 (2016). H. Zhang, Q. L. Bao, D. Y. Tang, L. M. Zhao, and K. P. Loh, “Large energy soliton erbium-doped fiber laser with a graphene-polymer composite mode locker,” Appl. Phys. Lett. 95, 141103 (2009). J. Xu, J. Liu, S. D. Wu, Q. H. Yang, and P. Wang, “Graphene oxide mode-locked femtosecond erbium-doped fiber lasers,” Opt. Express 20, 15474–15480 (2012). Q. L. Bao and K. P. Loh, “Graphene photonics, plasmonics, and broadband optoelectronic devices,” ACS Nano 6, 3677–3694 (2012). Y. H. Lin, S. F. Lin, Y. C. Chi, C. L. Wu, C. H. Cheng, W. H. Tseng, J. H. He, C. I. Wu, C. K. Lee, and G. R. Lin, “Using n- and p-type Bi2Te3 topological insulator nanoparticles to enable controlled femtosecond mode-locking of fiber lasers,” ACS Photon. 2, 481–490 (2015). C. J. Zhao, H. Zhang, X. Qi, Y. Chen, Z. T. Wang, S. C. Wen, and D. Y. Tang, “Ultra-short pulse generation by a topological insulator based saturable absorber,” Appl. Phys. Lett. 101, 211106 (2012). S. B. Lu, C. J. Zhao, Y. H. Zou, S. Q. Chen, Y. Chen, Y. Li, H. Zhang, S. C. Wen, and D. Y. Tang, “Third order nonlinear optical property of Bi2Se3,” Opt. Express 21, 2072–2082 (2013). H. Chen, Y. S. Chen, J. D. Yin, X. J. Zhang, T. Guo, and P. G. Yan, “High-damage-resistant tungsten disulfide saturable absorption mirror for passively Q-switched fiber laser,” Opt. Express 24, 16287–16296 (2016). P. G. Yang, H. Chen, J. D. Yin, Z. H. Xu, J. R. Li, Z. K. Jiang, W. F. Zhang, J. Z. Wang, I. L. Li, Z. P. Sun, and S. C. Ruan, “Large-area tungsten disulfide for ultrafast photonics,” Nanoscale 9, 1871–1877 (2017). K. Wu, X. Y. Zhang, J. Wang, X. Li, and J. P. Chen, “WS2 as a saturable absorber for ultrafast photonic applications of mode-locked and Q-switched lasers,” Opt. Express 23, 11453–11461 (2015). D. Mao, X. Y. She, B. B. Du, D. X. Yang, W. D. Zhang, K. Song, X. Q. Cui, B. Q. Jiang, T. Peng, and J. L. Zhao, “Erbium-doped fiber laser passively mode locked with few-layer WSe2/MoSe2 nanosheets,” Sci. Rep. 6, 23583 (2016). X. Y. Zhang, S. F. Zhang, B. H. Chen, H. Wang, K. Wu, Y. Chen, J. T. Fan, S. Qi, X. L. Cui, L. Zhang, and J. Wang, “Direct synthesis of large-scale hierarchical MoS2 films nanostructured with orthogonally oriented vertically and horizontally aligned layers,” Nanoscale 8, 431–439 (2016). W. J. Liu, M. L. Liu, M. Lei, S. B. Fang, and Z. Y. Wei, “Titanium selenide saturable absorber mirror for passive Q-switched Er-doped fiber laser,” IEEE J. Sel. Top. Quantum Electron. 24, 0901005 (2018). M. Zhang, R. C. T. Howe, R. I. Woodward, E. J. R. Kelleher, F. Torrisi, G. H. Hu, S. V. Popov, J. R. Taylor, and T. Hasan, “Solution processed MoS2-PVA composite for subbandgap mode-locking of a wideband tunable ultrafast Er:fiber laser,” Nano Res. 8, 1522–1534 (2015). K. Park, J. Lee, Y. T. Lee, W. K. Choi, J. H. Lee, and Y. W. Song, “Black phosphorus saturable absorber for ultrafast mode-locked pulse laser via evanescent field interaction,” Ann. Phys. (Berlin) 527, 770–776 (2015). H. R. Mu, S. H. Lin, Z. C. Wang, S. Xiao, P. F. Li, Y. Chen, H. Zhang, H. F. Bao, S. P. Lau, C. X. Pan, D. Y. Fan, and Q. L. Bao, “Black phosphorus-polymer composites for pulsed lasers,” Adv. Opt. Mater. 3, 1447–1453 (2015). J. F. Li, H. Y. Luo, B. Zhai, R. G. Lu, Z. N. Guo, H. Zhang, and Y. Liu, “Black phosphorus: a two-dimension saturable absorption material for mid-infrared Q-switched and mode-locked fiber lasers,” Sci. Rep. 6, 30361 (2016). Z. Guo, H. Zhang, S. Lu, Z. Wang, S. Tang, J. Shao, Z. Sun, H. Xie, H. Wang, X. Yu, and P. K. Chu, “From black phosphorus to phosphorene: basic solvent exfoliation, evolution of Raman scattering, and applications to ultrafast photonics,” Adv. Funct. Mater. 25, 6996–7002 (2015). Z. Guo, S. Chen, Z. Wang, Z. Yang, F. Liu, Y. Xu, J. Wang, Y. Yi, H. Zhang, L. Liao, P. K. Chu, and X. Yu, “Metal-ion-modified black phosphorus with enhanced stability and transistor performance,” Adv. Mater. 29, 1703811 (2017). Y. Song, Z. Liang, X. Jiang, Y. Chen, Z. Li, L. Lu, Y. Ge, K. Wang, J. L. Zheng, S. B. Lu, J. H. Ji, and H. Zhang, “Few-layer antimonene decorated microfiber: ultra-short pulse generation and all-optical thresholding with enhanced long term stability,” 2D Mater. 4, 045010 (2017). L. Lu, Z. Liang, L. Wu, Y. Chen, Y. Song, S. C. Dhanabalan, J. S. Ponraj, B. Dong, Y. Xiang, F. Xing, D. Fan, and H. Zhang, “Few-layer bismuthene: sonochemical exfoliation, nonlinear optics and applications for ultrafast photonics with enhanced stability,” Laser Photon. Rev. 12, 1700221 (2017). Z. T. Wang, H. R. Mu, J. Yuan, C. J. Zhao, Q. L. Bao, and H. Zhang, “Graphene-Bi2Te3 heterostructure as broadband saturable absorber for ultra-short pulse generation in Er-doped and Yb-doped fiber lasers,” IEEE J. Sel. Top. Quantum Electron. 23, 8800105 (2017). Y. J. Gong, J. H. Lin, X. L. Wang, G. Shi, S. D. Lei, Z. Lin, X. L. Zou, G. L. Ye, R. Vajtai, B. I. Yakobson, H. Terrones, M. Terrones, B. K. Ta, J. Lou, S. T. Pantelides, Z. Liu, W. Zhou, and P. M. Ajayan, “Vertical and in-plane heterostructures from WS2/MoS2 monolayers,” Nat. Mater. 13, 1135–1142 (2014). G. Zhao, J. Hou, Y. Z. Wu, J. L. He, and X. P. Hao, “Preparation of 2D MoS2/graphene heterostructure through a monolayer intercalation method and its application as an optical modulator in pulsed laser generation,” Adv. Opt. Mater. 3, 937–942 (2015). H. R. Mu, Z. T. Wang, J. Yuan, S. Xiao, C. Y. Chen, J. C. Song, Y. S. Wang, Y. Z. Xue, H. Zhang, and Q. L. Bao, “Graphene/Bi2Te3 heterostructure as saturable absorber for short pulse generation,” ACS Photon. 2, 832–841 (2015). Z. T. Wang, H. R. Mu, C. J. Zhao, Q. L. Bao, and H. Zhang, “Harmonic mode-locking and wavelength-tunable Q-switching operation in the graphene-Bi2Te3 heterostructure saturable absorber-based fiber laser,” Opt. Eng. 55, 081314 (2016). Y. Q. Jiang, L. L. Miao, G. B. Jiang, Y. Chen, X. Qi, X. F. Jiang, H. Zhang, and S. C. Wen, “Broadband and enhanced nonlinear optical response of MoS2/graphene nanocomposites for ultrafast photonics applications,” Sci. Rep. 5, 16372 (2015). C. Liu, H. P. Li, G. L. Deng, C. Y. Lan, C. Li, and Y. Liu, “Femtosecond Er-doped fiber laser using a graphene/MoS2 heterostructure saturable absorber,” in Asia Communications and Photonics Conference, Vol. 129 of 2016 OSA Technical Digest Series (Optical Society of America, 2016), paper AF2A. W. X. Du, H. P. Li, C. Liu, S. N. Shen, C. Y. Lan, C. Li, and Y. Liu, “Ultrafast pulse erbium-doped fiber laser with a graphene/WS2 heterostructure saturable absorber,” Proc. SPIE 10457, 104571M (2017). P. V. C. Medeiros, S. Stafström, and J. Björk, “Effects of extrinsic and intrinsic perturbations on the electronic structure of graphene: retaining an effective primitive cell band structure by band unfolding,” Phys. Rev. B 89, 041407 (2014). P. V. C. Medeiros, S. S. Tsirkin, S. Stafström, and J. Björk, “Unfolding spinor wave functions and expectation values of general operators: introducing the unfolding-density operator,” Phys. Rev. B 91, 041116 (2015). G. Kresse and J. Furthmüller, “Efficient iterative schemes for ab initio total-energy calculations using a plane-wave basis set,” Phys. Rev. B 54, 11169–11186 (1996). P. E. Blöchl, “Projector augmented-wave method,” Phys. Rev. B 50, 17953–17979 (1994). G. Kresse and D. Joubert, “From ultrasoft pseudopotentials to the projector augmented-wave method,” Phys. Rev. B 59, 1758–1775 (1999). J. P. Perdew, K. Burke, and M. Ernzerhof, “Generalized gradient approximation made simple,” Phys. Rev. Lett. 77, 3865–3868 (1996). S. Grimme, “Semiempirical GGA-type density functional constructed with a long-range dispersion correction,” J. Comput. Chem. 27, 1787–1799 (2006). T. L. Anderson and H. B. Krause, “Refinement of the Sb2Te3 structures and their relationship to nonstoichiometric Sb2Te3−ySey compounds,” Acta Crystallogr. Sect. B 30, 1307–1310 (1974). S. Bruzzone and G. Fiori, “Ab-initio simulations of deformation potentials and electron mobility in chemically modified graphene and two-dimensional hexagonal boron-nitride,” Appl. Phys. Lett. 99, 222108 (2011). S. Takagi, A. Toriumi, M. Iwase, and H. Tango, “On the universality of inversion layer mobility in Si MOSFET’s: part I-effects of substrate impurity concentration,” IEEE Trans. Electron Dev. 41, 2357–2362 (1994). N. Ma and D. Jena, “Carrier statistics and quantum capacitance effects on mobility extraction in two-dimensional crystal semiconductor field-effect transistors,” 2D Mater. 2, 015003 (2015). Fig. 1. State-of-the-art SA devices using the MoS2-Sb2Te3-MoS2 heterostructure. (a) Schematic of macrostructure and (b) surface structure of the fabricated MoS2-Sb2Te3-MoS2 heterostructure SA. Sb2Te3 (7 nm thickness) is in the middle of MoS2 (8 nm thickness). The gold film with 117 nm thickness is deposited on the polished fused silica substrate as a broadband reflection mirror. (c) SEM image of the surface of deposited MoS2-Sb2Te3-MoS2 heterostructure film. (d) SEM image of the film thickness. Fig. 2. Atomic and electronic structures of the MoS2-Sb2Te3-MoS2 heterostructure. (a) Side and (b) top views of the MoS2-Sb2Te3-MoS2 heterostructure. In (b), the detailed matching pattern of the (7×7)/(2×2) MoS2-Sb2Te3-MoS2 heterostructure is shown. The (7×7) MoS2 supercell is highlighted with yellow color, and the (2×2) Sb2Te supercell is denoted by the blue area. (c) Unfolding band structure of the MoS2-Sb2Te3-MoS2 heterostructure. Here, the Fermi level is defined as zero. (d) Band alignment of the MoS2-Sb2Te3-MoS2 heterostructure. The corresponding energy levels of pure MoS2 and Sb2Te3 slabs are shown in both sides. Fig. 3. Standard two-arm transmission setup. The SAM is the MoS2-Sb2Te3-MoS2 heterostructure SA mirror. Fig. 4. Characterization of the MoS2-Sb2Te3-MoS2 heterostructure SA mirror. (a) The modulation depth is 64.17%. (b) Raman spectrum of the MoS2-Sb2Te3-MoS2 heterostructure. (c), (d) Threshold damage condition of the MoS2-Sb2Te3-MoS2 heterostructure film at 12 mW. Fig. 5. Configuration of the mode-locked EDF laser. WDM, wavelength-division multiplexer; LD, laser diode; SMF, single-mode fiber; EDF, erbium-doped fiber; OC, optical coupler; PC, polarization controller; PI-ISO, polarization-independent isolator; SAM, MoS2-Sb2Te3-MoS2 heterostructure SA mirror. Fig. 6. Typical Q-switching characteristics. (a) Q-switched pulse trains. (b) Optical spectrum. (c) Q-switched pulse duration at 600 mW pump power. (d) RF spectrum at the fundamental frequency and wideband RF spectrum (inset). Fig. 7. (a) Pulse duration and repetition rate versus incident pump power. (b) Average output power and single pulse energy versus incident pump power. Fig. 8. Experimental results of fiber laser with mode-locked states. (a) Optical spectrum. (b) Pulse duration. (c) RF spectrum. (d) Phase noise.